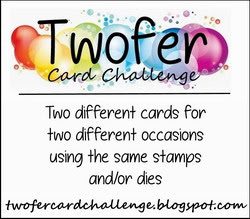 Twofer Card Challenge: Announcing the Twofer Card Challenge! Announcing the Twofer Card Challenge! I'm thrilled to announce a brand new card challenge coming soon! The challenge will go live on January 10, 2018!! Mark your calendars!! Wait. What? Yes, it's me, Darnell, and I've decided to start a card challenge! First, I'd like to say thank you to all the challenges who have helped me by sparking my creativity over the years. I'm sure I would have run out of ideas long ago if it weren't for them. It's been a pleasure playing along and I plan to continue supporting them. I'm hoping my challenge will fit nicely into this wonderful part of our stamping community! Although I try to make more than one card with a design, I fail at this miserably and just want to start a new design immediately. Although I resolve to make Christmas cards throughout the year, I fail at this miserably. I'm constantly in need of cards for my stash for all occasions. I need something intellectually and creatively challenging to keep the gray cells from being bored and my mojo juices flowing. Do you feel the same way at times? Are you ready to be really challenged? Do you want to strrrreeetch your brain, your design abilities, your card stash, and all those crafty supplies you have? Yes? Then this challenge is for YOU! The challenge will run once a month from the 10th of the month to the 24th of the month. The winner and honorable mentions will be announced on the 30th of the month and the winner will have the opportunity to be a Guest Designer. 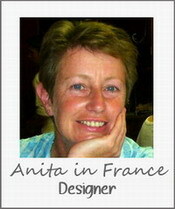 Each challenge will provide you with a "prompt" word which you will need to showcase in your two designs. ALL design styles are welcome here! I would like to thank my wonderful inaugural Design Team for supporting me and joining me on this adventure! You can see all their smiling faces on the side bar and you can reach their talented personal blogs by clicking on their noses. I hope you'll do that and leave them some kindness. 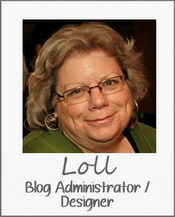 I would especially like to thank Loll for her excellent design skills and her invaluable assistance and advice. As you can see from the badge, the premise of this challenge will be to create two distinctly different designs for two different occasions using the same stamps or dies. The design emphasis will be on the words "distinctly different." The list of occasions is on the side bar. We will need to see that you created two distinctly different card designs using the same elephant on both. 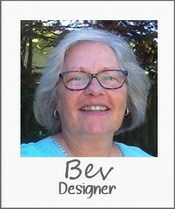 We will need to see that you have created cards for two distinctly different occasions. 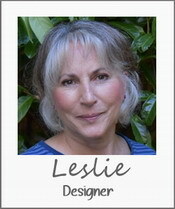 There is more specific information about design layout and using stamp-and-die pairings, negative/positive dies, etc. under the tab above called "FAQ." [FAQ=frequently asked questions.] And I know the Design Team's two creations each month will inspire you and show you by example. To make sure you are eligible to be chosen as a winner, you must follow the rules. Please read the Rules found on the tab at the top which will answer many of the questions you may have. Beginning with the first challenge, the rules will also be provided directly in the post for easy reference. 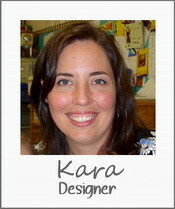 This challenge will replace my NBUS (Never-Before-Used-Schtuff) challenges which I held on my blog djkardkreations. I know. I'm sorry. You all embraced it so well, but I felt like we needed something new to sink our teeth into. I hope you will continue to reach for your NBUS when making your cards for this challenge! Using NBUS is always encouraged, but it is not a requirement for the Twofer Card Challenge. Thank you all for your support and dedication to my NBUS challenges over the years! You will always be able to access the galleries on the top tabs of my personal blog or via my Pinterest boards. The goal of the Twofer Card Challenge is to make you feel really charged up, really challenged, and really creative by growing your design skills and using your schtuff! Please click the follow button on the side bar above and spread the word on your blog, Facebook, Instagram, Twitter, Flickr, Splitcoast Stampers, text, grocery store bulletin board, or handwritten note across the back fence! See you on January 3rd with a reminder and on January 10th for the launch!! Sounds like fun, Darnell! Congratulations on your new 'baby'. Looking forward to the first challenge. It's great to see a new challenge Darnell, looking forward to 10th January! Look forward to the launch party! Sounds like a fun idea. What a great idea Darnell, looking forward to this new challenge. Sounds like fun....great idea! And your team is fabulous! Well Hammy kept this under wraps without squealing to Parsnip I must say! Will be back on 10th for a snoopy. Hugs Mrs A. Woo hoo! So excited to be part of this fabulous, unique challenge! Darnell and the whole team...what a well thought out challenge. Your FAQ's are clear, your rules are clearly stated, linking instructions as well. Ya all rock! I SOOOO love the logo. I might miss the first one, but I am looking forward playing along as the year goes by. Looking forward to your new challenge. It is a wonderful way to stretch our stamps and our thinking. Great idea and sounds like lots of fun coming up. See you on the 10th. This sounds like fun Darnell -- and truly a challenge. You've got a great DT,can't wait to see what they come up with. It feels like I'm waiting for Christmas to arrive! Oh wait, I am... but then... January 10th! Such a great and clear post, Darnell! Oh, this is too cool, Darnell! And what an all star design team you've put together! Hoping to play along with y'all! oh and love the header-who did this? Great idea, Darnell!! Can't wait to see the first prompt and get my thinking cap on! I'm in! This sounds like fun! Yay! Sold! I'm going to try this! I am very excited about this challenge, Darnell! Wow, how fun! I can't wait to play, what a great idea for a challenge! Yay! I'm looking forward to the launch and to participating. Congratulations Darnell and to the Fabulous Designers you have chosen. An exciting new Challenge that is sure to get our creative juices working overtime. Can't wait to see the first creations. Love the Logo and have added to to my blog. Hope Hammy is helping out! I'm excited about this new card challenge! Sounds like fun. I hope you will request to be included on Paper Playful - I need that reminder! CONGRATS! What a creative idea Darnell and your DT line up looks amazing! Can't wait to join the fun!! Best of Luck too! WooHoo! This is going to be fun and challenging! Can't wait! What a great idea! My goal for the New Year is to make at least two cards every time I sit down. I need to develop a stash! This should help. Woot Woot! Sounds like another DARNELL-FUN-IDEA! I'm not a social media wonder but this is my third comment on this wonderful new adventure you're taking us on, Darnell. IG, FB and BL (blogland) are abuzz with the news. Let the challenge begin! How exciting! What a great idea as my stash seems to be shrinking! Do I need to order and elephant stamp? Woo hoo and congrats! This does not surprise me at all, since you are such a force in the card making realm. I look forward to playing along! 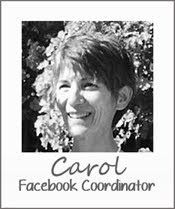 Can't wait -- this is a great idea for a challenge blog! Very cool and unique idea. It will for sure have you thinking outside the box and using your thinking cap! I’m going to try really hard to play along, Darnell. Truthfully, it’s a concept I’ve never embraced before. I know you’ll have a lot of success with the challenge. YAY!! Congrats on your new challenge. I look forward to playing along! It's official, how exciting! So thrilled to be among all these fabulous people in the Design Team! This challenge will get our mojo going in the new year! Your explanations are very clear! Sounds like everybody is excited about it! Congratulations on your new adventure Darnell and wishing you and the DT every success. Looking forward to playing along in the new year. 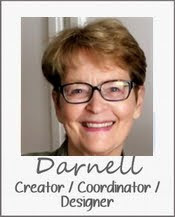 Woohoo Darnell, huge congrats... not sure I've ever done a two-fer but sure am willing to try, ..
....mm Christmas cards sounds like a plan, two a month for twelve months is two dozen cards! Yay! Joining definitely!! Love the sound of this Miss Darnell, look forward to it! Dear Darnell, I always knew, that you and Hammy have great ideas! Congratulation on your new adventure. Thank you Darnell, I think I might give this a go although coming up with one idea can be challenging enough so I hope I don't fail at the first hurdle, but as you say, challenging the old grey cells is good for us. This is an exciting challenge. I am looking forward to this new challenge. It's a great surprise. For me it will also be a difficult challenge, because it often happens that after using the stamp or die I put it back in the drawer and reach for the next, new designs. I am waiting impatiently for the inauguration :-) I see that your project team consists of great artists, the more I can not wait to see the projects of these amazing girls. I greet everyone and wish you a Merry Christmas to you and ladies from DT. I was very excited - went to rules and started adding you to my spreadsheet of challenges... then came crashing down with all the restrictions. But I will follow your blog - best of luck to all of you! What a fabulous idea, Darnell. I am all in! I am too impatient for the NBUS challenge anyway....have to use my new stuff ASAP! I am following and can't wait to grow from a new challenge! WOW! How original and yes, challenging. I'm going to accept the dare...I mean challenge. I'll be putting the badge on my blog soon. This is gonna be fun for me, or I'll die trying. Merry Christmas Darnell. Sounds like fun, Darnell! Can't wait to be challenged. Congratulations! Sounds like a lot of fun! And what a talented team you've got! Can't wait! A brilliant idea Darnell, congratulations! Looking forward to the 10th. What a wonderful idea Darnell! Sometimes I'm personally challenged to use my stamps in different ways. This is a great opportunity to expand my mind. You have a wonderful line up of designers!! Fabulous idea,Darnell! I can hardly wait to play along! Merry Christmas friend!! This is so exciting!! I cannot wait to play!!! This sounds like fun and really challenging! Hope I will be able to participate! Definitely something I'll look forward to playing each month! Congrats on starting this wonderful concept for the challenge and getting an awesome DT on the get go! Oh how fun, I can't wait!!!!! Congrats on the new challenge! Sounds like fun. You have selected some very talented people to be on your design team. I'm sure you will all give us some great inspiration. It's a concept that I have never tried...but it would have some great benefits in helping us to stretch the use of our supplies. Thank you for starting up this new challenge. Congratulations Darnell and all of the design team members! It's about time you started your own challenge! I love the idea too! Sounds like a lot of fun!! Look at all those fabulous designers you've acquired Darnell! Looking forward to the first challenge! Oh WOW!! 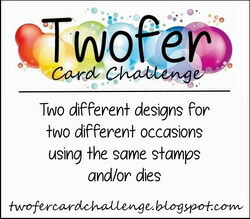 first of all, thank you Darnell for this awesome challenge, love the idea of creating 2 cards using the same Schtuff. Your panel of artist is TOPS!! oh my goodness, I see a lot of familiar, beautiful faces there and some I'm delighted to see for the first time. This is going to be FUN, FUN, FUN!! Big hugs to all of you fabulous artists and creators, I can't wait to participate. Hmmm - this will certainly rattle the mud in my cranium! !